Special meals for diabetics, vegetarians, people with food allergies and members of certain religious faiths, upon request (contact our call center on working days, prior 48hrs before departure at: 801 100 81 82 free call on a landline within Greece and +30 2311 22 47 00 for mobile phones & international calls to Greece). *A sealed, 330ml bottle of water is served in all domestic flights, as well as coffee upon request. In all international flights, apart the water and coffee, there is also the choice of juices and wine. 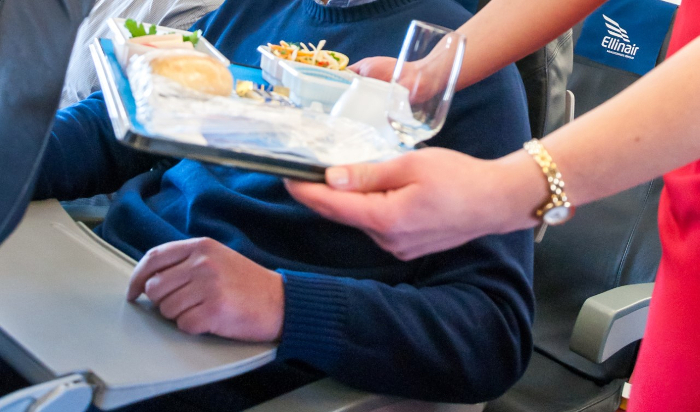 During international flights you can enjoy menus that consist of cover (bread and butter), salad, cold meal and dessert, that can be paired with the choice of red or wine white (private label).